This spacious, ocean-view rental property offers more than enough space for up to 8 people. Whether you’re traveling with the family in tow, or want to get away with your closest friends, you’ll have ample room to spread out and get comfortable...and spend time together. 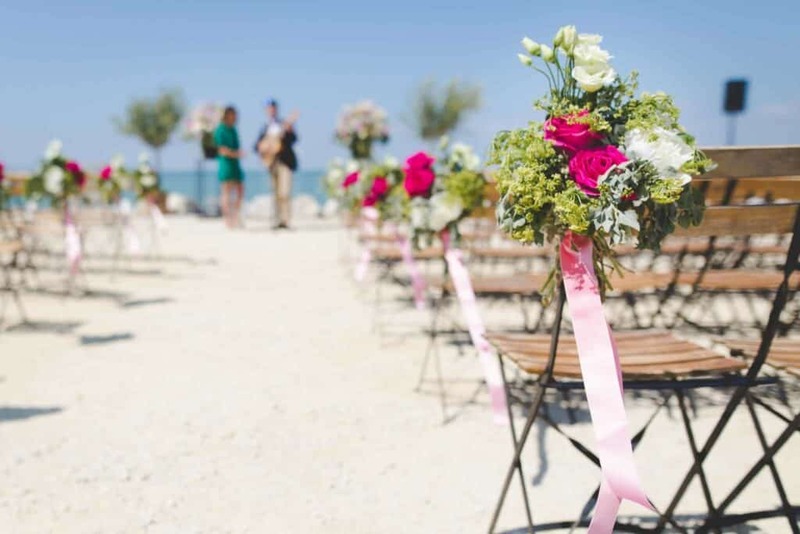 What’s not to love about The Breeze at Seascape? This 4-bedroom, 3-bath accommodation recently underwent a major renovation by the same builder of the 2013 HGTV Dream House on Kiawah – and the results are spectacular! Highlights include incredible kitchen and bathrooms, high-end décor finishes, an open floor plan, a sleeping loft and an oceanfront reading nook. Grab a glass of wine and make yourself at home on the huge deck, where you can hear the surf, smell the saltwater on the breeze and be hypnotized by the ocean view. Or kick back and relax in the oceanfront reading nook; with floor-to-ceiling windows, the sun soaks the room in warmth and light. With high ceilings, wood-paneled walls, reclaimed farmhouse wood-plank flooring, distressed décor, lots of natural lighting and a sea-inspired color palette, the living area, dining room and kitchen serve as inviting gathering places. The high-end kitchen features marble counters, tile backsplash, custom cabinets and premiere Viking appliances. Brew a fresh cup of joe in the deluxe Miele coffee maker, and pull a chair up to the casual bar area to discuss the day’s plans. Take advantage of the well-stocked kitchen and make a family dinner you can linger over in the evening. In the living room, get comfortable around the stacked-stone fireplace. The high-tech room has a 45-inch flat panel television, a Bose Bluetooth speaker and BluRay player, though you may prefer to browse the built-in bookshelves in the nearby reading library or simply sit around and chat. The living room opens up to the deck, so you’re easily treated to incredible views of the Atlantic Ocean. At night, treat yourself to well-deserved sleep in the master suite, which has exposed wood beams, a vaulted wood-plank ceiling and an electric fireplace. The adjacent master bathroom is luxuriously appointed with a spacious walk-in shower and rain showerhead, the ideal setting for rinsing off the saltwater and sand before heading out for the evening. In the second bedroom, you’ll find a queen-sized bed and private access to the hall bath on the main floor, while the third bedroom has 2 twin beds and a private bathroom. The kids will absolutely love spending the night in the loft, which has an additional 2 twin beds and overlooks the living spaces below. During your vacation, don’t forget to get outside and explore all that Kiawah Island has to offer. Located oceanfront on Kiawah’s quiet West Beach, the Breeze at Seascape serves up surf merely steps from your front door. Also within a short walk, find tennis courts, a golf course, local shops and restaurants. If you’re up for a day trip, hop in the car and visit historic downtown Charleston, just a 30 minute drive away. The Breeze at Seascape is a popular vacation villa. If your preferred dates are already filled, consider checking out our 3-bedroom Penthouse at Windswept, also oceanfront. The Breeze accommodates up to 8 people (including children and babies). Our 2-bedroom villa, the Mariah is just one floor down in the same building. The Penthouse at Windswept offers 3 bedrooms, 3 bathrooms, a generous floor plan and easy access to the beach and surrounding attractions. Whether you choose to spend the majority of your time relaxing inside with a good book or sinking your toes into the sand just steps from your front door, you’ll find the best of both worlds on the property’s balcony, which offers incredible 180-degree sweeping views of the Atlantic Ocean. Though the view speaks for itself, the Penthouse’s interior is also worthy of a look, with its custom drapery, chic color palette, original oil paintings, shiplap walls, designer furniture, granite countertops and hardwood flooring throughout. Inside, you’ll likely spend most of your time in the Penthouse’s communal spaces. With floor-to-ceiling windows, the rooms are bathed in sunshine for many hours of the day. Settle in to the high-tech living room, furnished with a 60-inch smart television and soundbar. The dining room and kitchen are easily accessible and appointed with everything you might need to whip up a favorite family meal, or use this opportunity to experiment with a recipe you’ve been meaning to try. At night, settle down in one of the villa’s cozy and beautifully decorated bedrooms. On the top floor, enjoy the superb ocean views from a king-sized bed, which is outfitted with a pillow-top mattress and the finest linens. A 50-inch flat panel television and large bathroom with a double vanity and deluxe tile shower round out the master suite. Down the hallway, guests in the second master bedroom are also treated to exceptional views, a 50-inch flat panel television and an even larger bathroom with a double vanity, deluxe tile shower and oversized garden tub. Downstairs, the third bedroom features 2 twin beds, a 50-inch flat panel television and an adjacent bathroom. When you finally tear yourself away from your cozy abode, the surf and sand are mere steps away. Also within a short walking distance, find the Night Heron Park, local shopping and lots of restaurants. For a short day trip, head to historic downtown Charleston. The Penthouse at Windswept is one of our most popular villas. If you need additional booking options, check out the 4-bedroom Breeze at Seascape, which we’re sure you will love. Accommodates up to six people (including children and babies). The Topside at Windswept is a beautiful 2-bedroom oceanfront villa that comfortably accommodates up to 4 adults and 2 children. Bathed in warm colors and ample sunlight, appointed in original artwork and topped off with the latest technology, the villa’s 2 master bedrooms, dining nook and living areas show off both personality and class. Sunrise Views From a King-Sized Bed. In the morning, enjoy the sunrise view from the warmth of your plush king-sized bed. During the day, let your toes sink into the handwoven wool rugs that punctuate the property, and take advantage of the kitchen, complete with granite countertops and stainless steel appliances. In the evening, linger over the ocean view from living room deck before settling in to the finely-styled living room for a conversation about the day’s events or to watch your favorite movie on the large flat panel television. Both master bedrooms have super comfortable memory-foam mattresses, Egyptian-cotton sheets, down-alternative pillows and flat panel televisions. Twin inflatable aero-beds are also available – we find these to be more comfortable, easier to manage and more versatile than sleeper sofas. Both master bedrooms have connecting bathrooms. The oceanfront master bath offers an oversized shower with ample room to prep for a night out on the town The second bathroom has a tub/shower combination. Located just 30 minutes from historic downtown Charleston on Kiawah’s East Beach, this vacation property is ideally situated. The beach is unsurprisingly a favorite destination – and from here, it’s literally steps to the Atlantic Ocean. A cooler and beach towels are provided as well. All you have to do is have a good time! Beyond the beach, put some walking shoes on and check out the nearby shops and restaurants. Several miles of bike trail also wind throughout the island; rent a bike and get peddling! If you need more space or your preferred dates are unavailable, consider staying in the 3-bedroom Penthouse or 2-bedroom Mariah, both located in the adjacent Windswept building. The Mariah at Windswept is a 2-story, 2-bedroom townhouse that comfortably accommodates up to 4 adults and 2 children. Bathed in warm colors and ample sunlight, appointed in original artwork and topped off with the latest technology, the villa’s 2 master bedrooms, reading nook and living areas show off both personality and class. In the morning, enjoy the ocean view from the warmth of your plush custom-built king-sized bed. During the day, let your toes sink into the handwoven wool rugs that punctuate the property, and take advantage of the kitchen, complete with granite countertops and stainless steel appliances. Both master bedrooms have memory-foam mattresses, Egyptian-cotton sheets, down-alternative pillows and large flat panel smart televisions. Twin airbeds are also available – we find these to be more comfortable, easier to manage and more versatile than sleeper sofas. Enjoy time in the private reading nook tucked in the upstairs master bedroom, which has stunning landscape/ocean views. Don’t be surprised to find yourself spending hours here, book and glass of wine in hand. Both master bedrooms have connecting bathrooms. Upstairs, a double vanity, over-sized tub and separate shower offer ample room to prep for a night out on the town, and the downstairs bathroom has a tub/shower combination. Located just 30 minutes from historic downtown Charleston on Kiawah’s East Beach, this vacation property is ideally situated. The beach is unsurprisingly a favorite destination – and from here, it’s literally steps to the Atlantic Ocean. A cooler and beach towels are conveniently available in the Mariah. All you have to do is have a good time! If you need more space or your preferred dates are unavailable, consider staying in the 3-bedroom Penthouse, located one floor up in the same building or the 2-bedroom Topside, located in the adjacent oceanfront building. 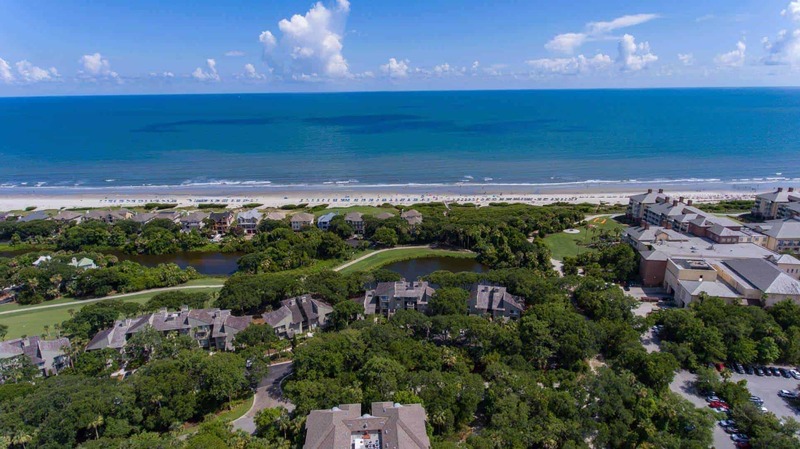 The Sandpiper at Shipwatch is located just an elevator ride away, making Kiawah’s West Beach easily accessible for a morning jog, an afternoon of fun in the sun or a stroll in the evening as dusk settles in. Of course, there’s more to Kiawah than just the sand and surf. Within a short walking distance you’ll find a golf course, tennis courts, shopping and restaurants – and historic downtown Charleston is only a 30-minute drive away. Recently renovated and professionally decorated with heavy custom drapery, hardwood floors, designer furniture and original artwork that ooze Southern charm, this villa has plentiful seating and places to mingle. In the kitchen you’ll find granite countertops and ample cookware, though the dining room and living room are close enough to carry on a conversation. Don’t be surprised if people sink into the comfortable living room furniture to catch a movie, or linger over breakfast at the intimate dining room table. And, of course, we encourage you to kick back in a counter-height teak chair on one of the villa’s oceanfront decks with a cocktail in hand to enjoy the sounds and smells of beachfront living. At night, retire to one of the rental's 2 bedrooms: a deluxe king-sized bedroom and another with 2 queen beds. All 3 beds have pillow-top mattresses, memory-foam toppers, Egyptian-cotton sheets and down-alternative pillows – oooh-la-la! Outfitted in white and pale blue furnishings, these spacious bedrooms embody a sense of relaxation that – when combined with the sound of the surf just beyond the windows – is sure to lull you to sleep. Both have balconies overlooking palmetto trees with the ocean beyond as well as private bathrooms and 26-inch flat panel televisions (just in case you need a break from the landscape). The Sandpiper also has free, shared laundry facilities located just across the hall – and we provide the laundry detergent. The Sandpiper at Shipwatch is a popular vacation villa. If your preferred dates are already filled, consider checking out the 2-bedroom Treetops or one-bedroom Vista, 2 of our other properties available in the Shipwatch complex. Note: A new hotel is being built in the West Beach area. You may see and hear construction during your stay. Certainly the updated furnishings and stunning hardwood floors are enough to turn heads in this 2-bedroom/2-bathroom quaint villa. But add the property’s limited but lovely oceanfront views from the living room wrap-around balcony, and its real treasure is revealed. Both bedrooms have their own private balconies as well offering calming views of the treetops. 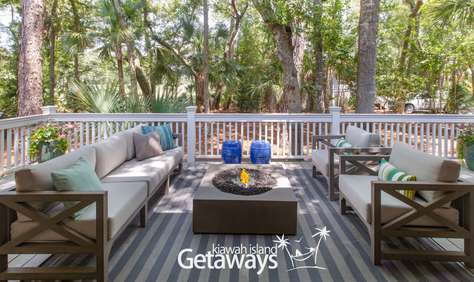 With room for 4 adults and 2 children, this Kiawah Island retreat is well-suited for families and friends looking for the perfect combination of comfortable accommodations and ease of exploration. Located on the 4th floor at the end of a hallway, it is both private and quiet. The kitchen is outfitted with granite countertops, stainless steel appliances and all the cooking utensils and gear you might need, and you’ll find plenty of space to whip up a classic recipe from home or try something new. Easy access to the dining and living rooms means friends and family can easily gather and move around the villa. Strike up a conversation from the kitchen, pull out a board game in the evening at the dining room table or bond over a favorite film in the living room, which features a huge Samsung flat-panel television with soundbar and a Blu-ray DVD player. Step out onto the living room balcony and enjoy your cup of morning coffee or glass of wine in the evening to the sounds of the surf and the lovely view. In the master bedroom, you will find a luxurious king-sized bed with thick memory foam mattress and heavenly linens, wall-mounted flat panel TV and a private bathroom. Down the hall is the second bedroom, which has 2 queen-sized beds both outfitted with pillow-top mattresses and quality linens. This bedroom, too, has it's own private bathroom. Additionally, this vacation villa is also outfitted with a full-size washer and dryer and wireless high-speed internet access. Of course, the beach will surely lure you from your home-away-from-home – as it should! After all, a vacation to Kiawah Island isn’t complete without a stroll in the sand, an afternoon lounging in the sand or time spent splashing in the rolling waves. To reach the beach, simply take the elevator to the ground floor and walk right out from the breezeway onto the boardwalk. Don’t forget to check out the other attractions and amenities nearby, including ample shopping, 5 world-class golf courses, local restaurants and tennis courts. Thirty miles of bike trails meander throughout the island as well, so renting a bicycle is a must. And, if you’re up for a day trip, consider making the drive to historic downtown Charleston, which is only a 35 minute drive away. If you love The Treetops at Shipwatch’s location, you might also be interested in the 2-bedroom Sandpiper or 1-bedroom Vista, both located in this same building. A beachfront rental with a sweeping view of the Atlantic Ocean, this one-bedroom/one-bath villa is the perfect place to sneak away with your loved one for a romantic weekend or longer. Drenched in rich colors and outfitted with sumptuous bedding, don’t be surprised if you have the urge to linger in the bedroom late into the morning. With an antique reproduction Tuscan bed, exquisite bedding and memory foam topper mattress, the room is both comfortable and beautiful. Your private balcony opens from the bedroom, so feel free to step outside and watch the beach awake from its slumber with your first cup of coffee – or second or third cup – in hand. The bathroom, appointed with a wide, 2-sink vanity topped with granite, awaits when you need to rinse sand from toes or prep for a night out on the town. No detail is left untouched with the sleek modern look, original art and custom-framed mirrors. Make your way into the all-stainlesss-steel kitchen to craft a meal you’ll both remember. Whether you’re putting the finishing touches on a favorite seafood dish or trying your hand at a new, elaborate creation, the Vista’s kitchen lets you cook in style with granite countertops, wood planked floors, a farm sink and an oversized bar facing the view. Get cozy in the Vista’s living room, which is punctuated in high-tech details and designer décor such as a 55-inch Samsung Smart TV, soundbar, custom media cabinet. Relax on the sofa for an evening in, and make sure to take advantage of the 2 swivel chairs, which are placed in front of the floor-to-ceiling windows. When you’re ready to venture out and create memories from this special destination, simply ride the elevator right to the beach, where you can spend the day splashing in the waves or walk hand-in-hand as the setting sun paints the sky at dusk. Beyond the beach, take your time over a long dinner at a nearby restaurant, pop in and out of the local shops, check out the Kiawah golf courses or take a day trip to historic downtown Charleston, located just 30 minutes away by car. Of course, all getaways must come to an end but, for a short while, The Vista at Shipwatch promises to be the ideal hidden retreat from the moment you check in to the last footprint you leave on the beach. Ocean views anchor both the living room and master bedroom. Or slide open the balcony door for a more immersive ocean-view experience. Take in the tranquil landscape as the sun rises over the open water, listen to the steady sound of waves in the distance, and indulge in the refreshing sea breeze. With 1 bedroom and 2 bathrooms, the Escape at Windswept can comfortably accommodate a couple or young family searching for the perfect beach vacation. Sleep in the master bedroom, which features majestic natural views from the comfort of a king-sized bed. Outfitted with pillow-top mattresses, memory-foam toppers, Egyptian-cotton sheets and down-alternative pillows, it’s the ideal place to enjoy a hot cup of coffee on a lazy morning or catch up on the latest news, which you can watch on the suite’s 46" smart TV. When you’re finally ready to start your day, feel free to take your time in the master bathroom, complete with a large glass walk-in shower. In addition to serving as extra sleeping space, families often pass time in the living room, making plans for a day on the beach or kicking back in the evening after spending all afternoon in the sun. An accessible floor plan in this part of the villa makes it easy to move from one room to the other as you cook a meal in the fully furnished, elegant kitchen appointed with stainless steel appliances or play board games in the dining room as the sun starts to set. And, to make your vacation that much easier, the on-site washer and dryer are located just off the kitchen. Head out the door to see what the neighborhood has in store. Only a one-minute walk away you’ll find 10 miles of pristine beach. Also within walking distance are shopping opportunities, restaurants and the Night Heron Park. For a longer excursion, hop in your car and head to historic downtown Charleston, only a 30-minute drive away. As idyllic as The Escape at Windswept is, if you feel you need more room for your vacation, check out the 3-bedroom Penthouse and 2-bedroom Mariah, both villas located in the Windswept complex. 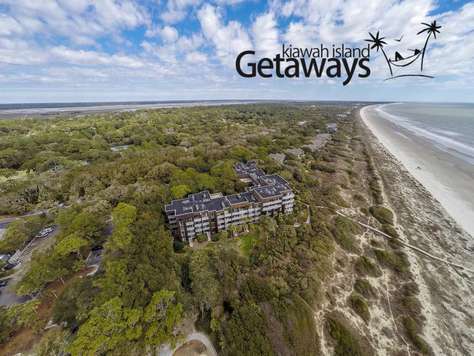 Here’s why you come to Kiawah…to feel the breezes while you sip your coffee first thing in the morning…to listen to birdsong and the sound of chirping cicadas as the day unfolds…and to bike down to the surf and sand whenever you like. It’s all possible at the Lazy Day on Bobcat Lane, a Kiawah Riverview rental located close to the Main Gate. Steal moments to yourself on a sprawling deck surrounded by tall palmettos, relax and recharge at the community pool, and bike just minutes to the beach when you’re ready for a dip in the ocean. Nestled amidst the live oaks and palms in one of Kiawah’s newest neighborhoods, this home offers stunning Kiawah River water and sunset views and is located within easy bike access to Kiawah’s 10 mile beach, Cougar Point Golf Course, Freshfields Shopping Village, and the West Beach Conference Center. Note: A new hotel is being built in the West Beach area. You may experience construction noise during your stay. At 1,750 square feet, our 4-bedroom, 4-bathroom property comfortably accommodates up to 8 people – but as you’ve probably guessed, this is not your typical cottage. The unique design of the living space features ample space to kick back and relax in front of a working fireplace. Punctuated by a high-vaulted ceiling, the living room is a tech-lover’s dream with cable and Apple TV available on a 60-inch Samsung high-definition smart TV, and a soundbar and subwoofer combination that adds enhanced sound to your favorite movie or tunes. Take advantage of full-access WiFi coverage in both the indoor and outdoor living spaces, and enjoy Pandora, Internet radio and AirPlay in the living room, kitchen, screen porch and outdoor side porch. Without question, among the property’s highlights are the stunning gourmet kitchen and top-of-the-line outdoor grilling area complete with a fire pit. Whether you want to throw together your favorite meal or try a new grilling recipe, this is your opportunity to let your cooking enthusiast come out to play. And, just as you can choose where to cook, you also have a choice when it comes to dining. Outside, feel free to relax around the fire pit with friends and family and exchange stories from the day. Or, set up shop in the al fresco dining area on the back deck. Overlooking the lagoon and outfitted with a ceiling fan, heaters and television, this screened-in space is inviting from sunrise to sundown (and late into the night!). The property’s 4 bedrooms – 2 with king-sized beds, 1 with a queen-sized bed and 1 with a deluxe queen and twin bunk – are all outfitted with cutting-edge home technology, pillow-top mattresses, luxurious linens and high-end touches. Each bedroom has access to its own bathroom with walk-in showers, and 2 bedrooms have direct access to an outdoor shower area. This completely private outdoor shower is the perfect place to rinse off that lingering beach sand and saltwater before heading out for the evening. Despite the Surf Shack’s appeal, make sure you tear yourself away to check out what awaits around the island. Within walking distance are the community pool (one minute away), Atlantic Ocean with beach access (5 minutes) and Straw Market shops and restaurants (ten minutes). Hop in your car for a 30-minute drive to historic downtown Charleston. Unsurprisingly, The Surf Sack at Sparrow Pond is one of our most popular Kiawah Island rentals, so book soon to reserve your stay. If it is already reserved for your chosen timeframe, don’t panic! Instead, check out our 4-bedroom oceanfront Breeze at Seascape property – you will be delighted! Accommodates up to 8 people, including babies and children. Great vacations are made of great moments: Sharing wine on the deck overlooking the lagoon, with birdsong in the trees and salty sea breezes rustling the palmettos. Strolls to the beach in the bright afternoon sun, followed by long, luxurious showers in one of two giant walk-in showers. Catnaps in the den. Feasts at an upholstered dining table looking out over the lush golf course. Welcome to The vV at Turtle Point. This high-end rental property presents more than enough space for 8 people to celebrate the small things that make a vacation memorable. The vV at Turtle Point recently underwent a major renovation—designed by Zach T. Carney Architects—and the results are spectacular! Highlights include sparkling new kitchen & baths, high-end décor & finishes, an open floor plan, and deluxe bedroom suites you'll want to take home in your suitcase. The combined living, dining and kitchen area features exposed wood beams, shiplap walls and ceilings, reclaimed farmhouse wood-plank flooring and mantel, distressed décor, a flood of sunlight and a color palette that capture the dusky blue moments just before sunrise on the beach. If you like to cook, you will adore this kitchen, featuring marble counters & backsplashes and premiere appliances. The custom cabinets have been expertly stocked by and for foodies, with all the gadgets and cookware necessary for crafting delicious meals. Friends can pull up a chair to the casual bar area to pitch in, or chat over wine while you work your culinary magic. The living room is perfect for both high-tech entertainment and low-key gatherings. For the first option, make use of the 55-inch flat panel television, soundbar and BluRay player (complimentary Wi-Fi is also provided throughout). For the second, browse the built-in bookshelves in the reading library, or simply sit and chat on comfy sofas. The living room opens up to the deck, so the incredible views of the lagoon and golf course stay close. A blissful night's sleep begins in one of the two master suites—one upstairs and the other on the main floor for privacy. Each has high ceilings, large TVs and lagoon and golf course views to greet you in the morning. Two attached master bathrooms feature gorgeous walk-in showers with rainfall showerheads. Rinsing away the sand and salt after a day at the beach has never been more indulgent! In the third bedroom, on the main floor, you’ll find two twin beds—perfect for kids—and a private bathroom that also serves as the living area powder room. Tucked just off the living room is a cozy den with a queen-sized sleeper sofa. While The vV at Turtle Point is a treat in itself, Kiawah Island is a gem you'll want to explore. Located within Kiawah’s East Beach, your doorstep is a 3-minute walk from the surf and 10 miles of flat, compact sand that's perfect for bike rides, romantic sunset strolls and morning jogs. Also within a short walk, you'll find tennis courts, a golf course, and the Sanctuary Hotel, featuring fine dining, poolside lunches and hand-scooped ice cream. If you’re up for a day trip, hop in the car and visit historic downtown Charleston, just a 30 minute drive from the rental. The vV at Turtle Point is a popular vacation villa. If your preferred dates are already filled, consider checking out our other three-bedroom, scenic-view properties. The vV accommodates up to 8 people (including children and babies). Here’s why you come to Kiawah…to feel the breezes while you sip your coffee first thing in the morning…to listen to birdsong and the sound of chirping cicadas as the day unfolds…to stroll over to surf and sand whenever you like. It’s all possible at Three Cougar on Greensward, a scenic rental tucked into the Cougar Point Golf Course. Steal moments to yourself on a sprawling deck surrounded by tall palmettos, relax and recharge in a high-end interior with three extra-comfortable bedroom suites, and walk just minutes to the beach when you’re ready for a dip in the ocean. If your favorite kind of evening is one spent watching the stars blink overhead, you’ve found your getaway. Outdoor living is at its finest at Three Cougar on Greensward, where you can kick back with a cold drink around a toasty fire pit. Luxury lounge furniture invites you to sit and chat late into the night, and a deluxe gas grill offers an option for easy evening meals. Cap off the night with a romantic soak in the two-person hot tub privately located on the deck off the master bedroom. Or stay in the shade and relax on the covered porch. Spread out and admire the views of the swaying palmettos and greenery in total comfort. Discerning chefs will be in their element in the gourmet kitchen, outfitted with sparkling stainless steel appliances and white marble. Find all the dishes, gadgets, and cookware you’ll need for elegant feasts in the comfort of home. A four-seat island offers a spot for guests to taste h’ors d’oeuvres or sip wine before settling down in the formal dining area, which features a round table for six with artful wicker chairs. As fitting for quiet evenings in as it is for morning excitement, the living area features plenty of seating and a chic beach vibe with sandy and ocean hues. Get snug in an armchair in front of the gas fireplace, or cozy up together on the couch in front of the 60” Samsung Smart TV. An airy tray ceiling and open design creates a setting where you won’t mind spending hours reconnecting with your friends and family. With luxury linens, high-end appointments, and a large Samsung Smart TV, each of the bedrooms offers a place to completely relax at the end of long days on the beach or green. The sumptuous master has a king-size bed and en-suite bathroom with walk-in shower. Steal away to the private master balcony, featuring a two-person hot tub for blissful soaks before you drift off to sleep. Two guest bedrooms each have their own queen-size beds and en-suite bathrooms—one with a walk-in shower and the other with a shower/tub combination. An additional half-bath means they’ll be no need to wait in line to get ready each morning. This rental is tucked into the third hole of the Cougar Point Golf Course and delights with scenic views and easy access for an afternoon on the green. Enjoy a quiet setting so close to the ocean you can feel its breezes—walk just 7 minutes to Kiawah’s stunning hard-sand beaches with gentle waves. Take your bikes for a spin to Freshfields Village—just 15 minutes away—and spend an afternoon strolling around the boutiques or catching live music or markets. Afterwards, grab a bite at an any one of the village’s well-regarded restaurants. For history, culture, and city-style excitement, downtown Charleston is just 35 minutes away by car. This 3-bedroom, 3-bath property accommodates up to 6 people - the ideal choice for a family vacation or a getaway with friends. The open floor plan makes it simple to wander from the kitchen to the dining room and living room, so you’re never far from the action. The cottage’s kitchen is outfitted with elegant marble countertops, a built-in ice maker, sub-zero refrigerator and Wolf range – and all the pots, pans, utensils and cookware you could possibly need. At the adjacent dining dining, reminisce about and unwind from a long, happy day on the beach. If you prefer, take advantage of the outdoor deck, complete with a grill and table for al fresco dining. At The Shell Seeker at Sparrow Pond, you have your choice of places to relax and unwind. Step out on the screened-in back porch, complete with comfortable wicker seating, tranquil wooded views and enchanting evening landscape lighting. Or, feel free to kick back in the living room, which features media center with a 40-inch flat-panel television, DVD player and CD player. Wireless internet, surround sound pumped through built-in speakers and a small library of books and DVDs provide ample entertainment after the sun goes down. Note: Two living room chairs and couch have cushions wrapped in down. The cottage’s dual master suites (that's right: 2 master suites!) beckon with king-sized deluxe beds and pillow-top mattresses, Egyptian-cotton sheets and high-end, down-alternative linens. Both master bathrooms are spacious and well-lit with large walk-in showers – and one even has a claw-foot tub. For those who choose the 3rd bedroom, you’ll find 2 twin beds, equally outfitted in choice bedding, a 27-inch flat-panel television, a DVD player and a bathroom with a shower/tub combination. And don’t worry if you need to throw in a load of laundry during your stay: this fully furnished retreat also has a washer and dryer. When you tear yourself away from your home-away-from-home, make sure you check out the surrounding neighborhood. Claim your spot on the nearby pristine beach, or swim in the community pool – located just a 3-5 minute walk from the front door. Expand your explorations a bit further to find the West Beach Shops, Cougar Point Golf Course and several local restaurants. The lovely historic downtown Charleston is a mere 30 minutes away. ​Welcome to the Sunny Day at Turtle Cove. Accommodating up to 4 adults and 2 kids, this spacious and airy second-floor holiday retreat offers sunny lagoon views graced with grand oaks and Spanish moss. Check out the plush master bedroom, outfitted with a comfortable queen-sized bed, a pillow-top mattress, Egyptian-cotton sheets and down-alternative pillows and comforters. A 24-inch LCD flat-panel TV/DVD and private bathroom with a double vanity and tile shower round out this well-adorned corner of the house. Swing open the door down the hall to find the second bedroom, which features 2 twin beds and another TV/DVD combo – perfect for catching that late-night film or to keep the kids entertained for a moment or two. A second bathroom with a shower/tub combination lies adjacent to the room. 2 additional inflatable beds, a washer/dryer, a 32-inch LCD flat-panel television, DVD and CD/MP3 player in the living room and wireless internet throughout round out this perfectly appointed property. Though 2 bedrooms and 2 bathrooms invite everyone to spread out and enjoy private time, we’re sure you’ll want to spend most of your time in the lovely kitchen and living areas. In the brightly lit, well-appointed kitchen, you’ll find all the utensils and cookware you’ll need to enjoy a night in. Invite the family to keep you company from the bar counter or dining table while you try a new recipe or whip up a meal you’ve always loved. When it’s finally time to relax, head to the living room. With floor-to-ceiling windows, a cool tile floor beneath your feet and ample seating, this popular space of the rental is where families love to play games, friends catch up over a glass of wine and everyone takes part in planning the day’s activities. And there are so many things to choose from! Of course, the seven-minute walk to the beach is likely high on everyone’s to-do list. Though beach towels and coolers are available at the Sunny Day at Turtle Cove, just about anything else you might need – beach chairs, umbrellas, bikes and more – are easy to rent. Take a stroll on the more than 30 miles of trails that meander throughout the island, and spend time exploring the shops and restaurants that give Kiawah Island personality. For an afternoon getaway, make the 30-minute trip to historic downtown Charleston. Whether you spend your days relaxing inside, taking in the fresh air beyond the front door or discovering all the area has to offer, we have no doubt your stay at the Sunny Day at Turtle Cove will leave you feeling rejuvenated, refreshed and undeniably happy. Accommodates up to 4 Adults and 2 Young Children. Make yourself at home at The Shade at Seascape, the perfect place for a long weekend or holiday break. Ideally suited for a young family of 4, or just 2 adults, the Shade is a private-end unit in our Seascape complex with lots of space, plenty of privacy and ample sunlight that shines through the villa windows. No detail has been left untouched in this intimate property, which melds the beach cottage vibe with luxurious touches. Granite countertops, hand-scraped maple wood floors and a double vanity in the bathroom with an Italian limestone walk-in shower exists side-by-side with cottage-style furnishings, saltwater-tinged fresh air breezes and a small bit of beach sand that snuck its way in on the soles of your feet. Spending quality time with your loved ones is simple in the Shade’s well-outfitted living spaces. Take advantage of stainless steel appliances, lots of counter space and all the utensils, pots and pans you might need in the kitchen to make your favorite meals – or experiment with a new recipe you’ve been meaning to try. An open kitchen and living room make it easy to talk, laugh and make memories together as you while the hours away. Of course, all the digital comforts of home – wireless high-speed internet and 2 large smart Samsung TVs – can offer diversion as well. And don’t forget to step outside onto the screened-in back porch and relax, read or visit for a while on an Adirondack chair overlooking the wooded yard while a ceiling fan quietly spins above you. Though the Shade offers everything you might need for a holiday accommodation, it wouldn’t be a beach vacation if you didn’t explore all the surrounding area has to offer. Don’t forget to grab the cooler and some beach towels as you head out the door. A one-minute walk separates you from the ocean, where your family can enjoy the sunshine, splash in the water or exert some energy on body boards or rented bicycles. Beyond the beach find shops, restaurants, golf and tennis just a short walk as well. At night, get comfortable in the villa’s master bedroom, complete with a pillow-top mattress and Egyptian cotton sheets, while the kids can embrace the summer sleepover atmosphere on an inflatable bed. We’re sure you’ll sleep well after a full and satisfying day on Kiawah Island.